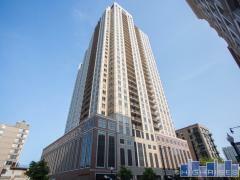 Michigan Avenue Tower 1 is a modern high-rise condominium tower located in the two-building Michigan Avenue Towers complex in the South Loop. Each of these is a full-service building complete with pool, fitness center, door staff, sun deck, clubroom, etc. Garage parking is available for an extra cost. There are also condominiums available in Tower II. Have any comments or questions about Michigan Avenue Tower I? Ask your question and/or share your thoughts about this Building.